2017? That was my initial thought as as soon as Russia attacks China war has in principle ended with Russian loss even if it were just started by then. But somehow I saw 2019 in Your picture, which is obviously wrong as triangle touches ground prior to that calendar point. will I also do not believe it wil be an overnight move, I think we have to look to see what happened in early 2011 to see what can occur once a fire is ignited. Charts do tell a good story. We have so many of us and others sitting on the sidelines looking for entry points that I think that we can see a fire ignited rather quickly, plus the supply issue helps. Craig has discussed it before when shorts (hedgies) have to close their shorts and then go long. We in this cycle have not come close to seeing a real short cover squeeze, which quickly morphs into a long buying spree. We have such an unloved sector right now--plus I figure all those that have dissed metals from 250 to 1900, then poured it on the last 3 years, will be getting in metals this next upswing. They will not want to miss the next leg up. the analogy is me dissing the general stock market while its tripled (on the strength of printing and debasement which all along should be better for metals than stocks. However, when it (SPX) does selloff again, I probably will go long spy calls when I think we hit a bottom. . Or spxl calls. I do plan to go long spxs calls to make money on the downside. Maybe do the triple inverse russell 2000. Something Gary Kaltbaum plans to do. Kranzler likes shorting housing--that shoudl have worked already. But the game continues. We are at teh point where the Fed has been saying that they manipulte teh fixed income market--so the rest is not a stretch, and now we have Gruber saying they manipulated data for healthcare--SOP right now. Lets deceive just like in 1920's Germany. Mickey, I do NOT think Daneric's overall count is correct; but believe that wave A of II from 2011 ended this month at 1130. Next stop would be your 1525 (circa); and perhaps 1800 depending on the shape and form of wave B of II. The issue is whether we will see a pullback before then after the current set of impulsive waves to the upside. A 61.8% retracement; or a test of the lows? Sorry. The 8th chart down on the link. Cheers. I am constantly flipping back and forth on not just TA but the various techniques within TA. Depending on the "product" I am usually 2/3 fundies and 1/3 TA but I also see how many ways one can intrepret a chart, drawing lines, french curves etc. the trump card is one day our system is going to break. Japan is knocking on the door now. The US Debt to GDp is #9 among 189 countries--Mexico is better than we are, Iran and Russia and China re better--the only ones worst are Japan and 7 other Eurozone countries. The President just signed something about amnesty for immigration. did you or anybody see or hear any discussion of the cost of this? Buehler, anybody? We are broke as a country, the states and individuals except maybe the top 1% who many will get creamed when the market collapses. Some, know whats going on and have protected themselves. I know mega millionaires (over 50 mil) who do not believe in PM and are loaded up with hedge funds on one side of their asset pool, and index funds on the other. bottom line--when this breaks, it breaks suddenly and big. Charts probably will not tell us when although I do think they are necessary for short term trading. How many times have we seen what we thought was a breakout, to get turned around suddenly by the games. yeah--so I watch TA take it in, etc Once day a breakout in PM will keep on going. by the way, I doubt many here think todays GDP was close to real. Very little is real now. Yeah--even down to the COT reports, or GOFO. ask Hagel, Gates and Panetta. Defense Secretary: only accepting applications from "Yes" men. I have seen that in a number of organizations--you can't wait to get out. I have been buying Jan otm options on gld slv GDX and GDXJ--and SSRI. Thats my set up. Plus my stacks. Which over this weekend I have to remind the kids when they come in where it is and how much there is so when I croak they know whats to be found. I hope I am not being misunderstood. New lows are possible for Gold:USD but I now consider that event to be less than 50:50 odds. I increased holdings during the last downswing by approx 10x the usual addition I have worked with during the last 2 years. I posted this several times already but just to reiterate and be absolutely clear: I'm long. Now I'm looking for safe opportunities for increased leverage, subject to retests or slight new lows and what comes. Counting on new lows? Not all that much, but they could happen and it wouldn't faze me because I have fully paid assets and no leverage on. I hope that in a short time I can find some support level to work with leverage safely. There is a noticeable lack of hat tips on this thread to posts made during the recent short term rally. This interests me in a contrarian sort of way. Wow this thread is on fire again :-) lovely chart there Hammer, a GSR at 16 before July 2019 fits my eye perfectly. I think the uniformed triangular shaped cycle is spot on ! The GSR is out of whack at the moment but there is a very strong possibility that would change in 2015 imho. Green Latern, no worries, Bo Polny is not important, I consider him as entertainment only. I hope he is right thou, but it's highly unlikely. Eclectic, yes I shall see if I have some info about the 1999, turn around, interesting stuff. AM you mentioned something about getting into stocks a couple of months ago. As the no,1 analyst about qualified guesses I was worried that you was on the same track as some others out there about a new lower low before Christmas. I am a value investor trying to ride/trade the swings between asset classes. I am always long term. Underwater right now but that could all change in a hurry in 2015. Gold chart from 1999 bottoming phase. And bottoming phase of today, very similar, isn't it. and then 8 weeks later, this happened! I have studied the 1999 area a lot. There are differences at this point in price and the main action on a weekly , but you're right when it comes to many indicators having a similar reaction at recent lows. What I mean by price action then vs now ...1996 to 1999 lows as a form of triple bottom too, but that one broke down and continued lower for 8-10 wks . The recent triple bottom that we have on a 3 yr chart is (At this point ) what I have been pointing out along the way - A fast shake out . It didnt break down in crash form and continue lower for weeks (MOST are expecting that continued drop to $800 - $1000 , and therefore have not positioned long). Thus it could leave them behind if it pops higher. Thx for writing...you are correct on the similar indicators. It's all about how many pivots this rally takes out before stopping, and how many pivots are given up when the next pullback begins. Either the buyers surge in at present levels (approx) as sentiment changes or price gets to go another phase lower to trigger that. 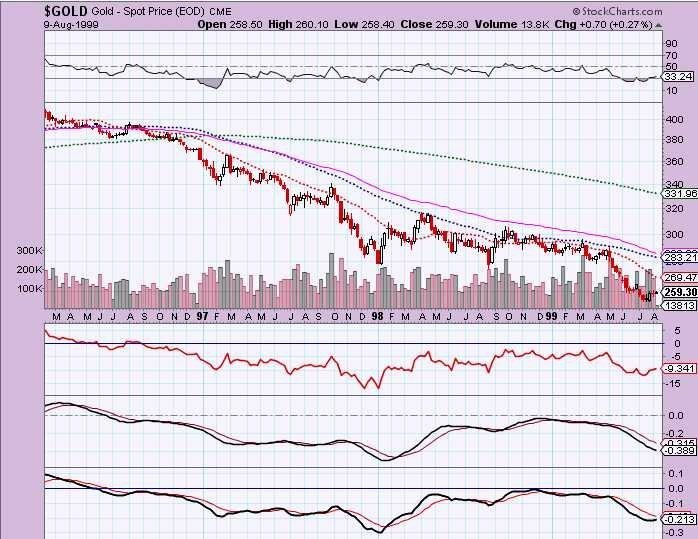 Gold is now re-entering the popular mind and media. Look at the Swiss initiative, the Marie lePen open letter to their Central Bank about a French gold audit, the Italian referendum project for leaving the Euro gaining momentum, the Asian CB purchases being openly discussed, the Dutch CB 122 tonne gold retrieval, Deutsche Bank research kite flying about gold acquisition from EU citizenry by the CBs and the like. To knock it down here would take enormous resources just as they are getting stretched to the limit. Their (Au bears & Co.) cost:payback ratio must be looking pretty poor by now. And Yves Mersch at the ECB said gold was one of those assets (first mentioned, I believe) they could spend those QE Euros on. 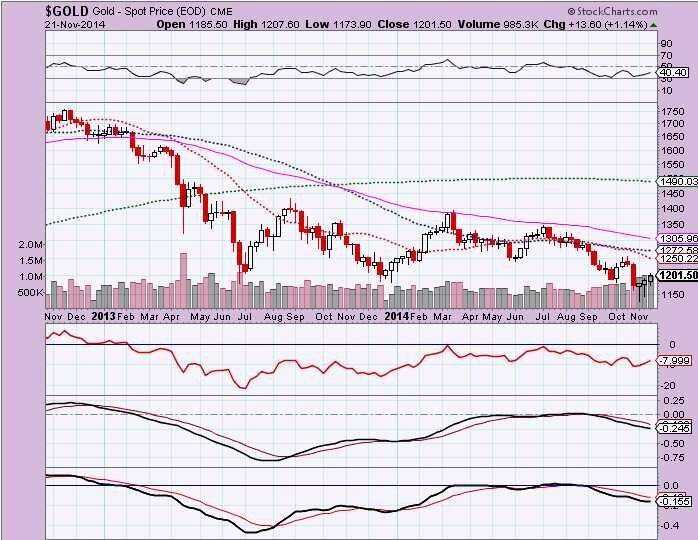 And on BNN recently, our good friend Jeff Christian was out - to me that is usually at a critical juncture and perhaps in this video, he's just buying cover and acknowledging gold should go up from 1180 to "...1220 this year..."
Wed, Nov 19, 2014 - 2:45 PM BNN speaks with Jeffrey Christian, Managing Director, CMP Group about where we can expect the price of gold to go from here. Christian does not see Russia diversifying its reserves into gold as a significant event in the long-term and sees the current $1,180 level as the bottom for the bullion price. All downtrends taken out. Hah! Holiday-itis .... or something that's going to hold ... hopefully. Now to see if it holds. Gold silver ratio at 81.72. Above the one minute chart showing the algo bids upwards and subsequent drop. Below the weekly showing the April 2013 "gap" which traders "stops" were targeted. GSR back to 71.995 ... awwwww! I can't wait to read the official excuse/explanation for that. File it under fantasy fiction when it comes out. Is it a bad thing when Prechter gets bullish? ... [there has been] a recent sea change in sentiment toward gold. [It] does not reflect the breadth of bearishness that existed in 2001, but it's negative enough for an intermediate-term low. Other measures of investor psychology concur. Two weeks before gold's September 2011 peak, the 5-day Daily Sentiment Index (trade-futures.com) rose to 96% gold bulls, a record optimistic extreme that dates back to April 1987, when the data start. Last week, on November 5, the 5-day DSI fell to just 5%, a record pessimistic extreme. So far, that is the day of the daily closing low for gold at $1140.52. Seems to say we finished (A) (3 years) and (B) high should be 1430 to 1500 before we start the (C) wave. I have trouble believing we'll have to wait so long from now (is that 5 years to 2019?) to finish (C) . I wonder what the charts would look like in inflation-adjusted dollars and in Shadow Stat's inflation-adjusted dollars.